Dear readers, good day! I am so glad to announce that today is my blog’s first anniversary! I can’t believe it, time certainly does fly when you are having fun! I would like to take this opportunity to thank all the readers of Seasaltwithfood for supporting and leaving many nice comments on my blog. Not to mentioned as well, many emails with wonderful ideas and encouragements. I appreciated the kindness and will certainly continue to share as much recipes possible. Thanks! FYI: One of my readers have also been so kind to bring to my attention recently that a certain new blog based in the UK, http://www.recipeideas.org.uk/, have been blatantly plagiarizing contents from my blog. Shocking! So, do you reckon that is some form of recognition that I must be doing something right? What do you think? Should I be flattered or upset that someone has made such an effort to steal my postings? Anyway, I hope the owners’ of that blog will read this and have some dignity to stop ripping off my work. Very disgraceful, don't you think so? Anyway, I was rather busy the past few weeks and did not plan for any celebration for my blog’s first anniversary. Then, my two lovely kids thought they will make something pretty and sweet for me. I decided to have them make these cute brownie pops. It’s easy and a fun little project in the kitchen for them. So, keep those ideas and comments coming. Enjoy the recipe. Combine the orange zest with sugar. In a medium bowl, combine the flour and salt. In a medium saucepan, melt the butter, chocolate and brown sugar over a very low heat. Stir until the mixture is smooth and remove from the heat and cool for about 2 minutes. Then stir in the vanilla, egg and orange zest into the chocolate mixture. Stir until well blended. Add the flour and stir only until it is incorporated. The batter should be smooth and glossy. Spoon the batter into the mold and bake for 14 to 16 minutes, or until the tops of the brownie spring back when touched. Transfer the mold to racks to cool for 3 minutes before carefully releasing the brownies. Cool to room temperature on the racks. To assemble to Brownie Pops: Insert a cookie/lolly stick into the brownie. 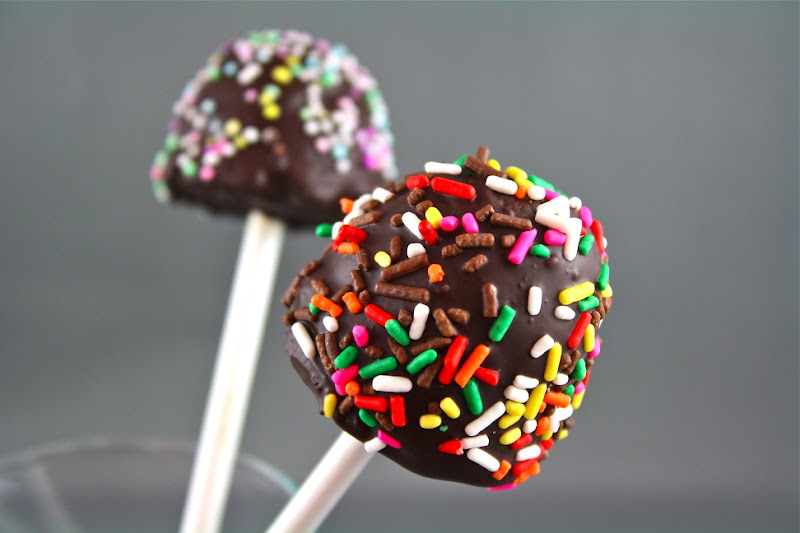 Dip the brownie pop into the melted chocolate and decorate with sprinkles. Refrigerate the brownie pops for 15 minutes to set the glaze. What great idea, especially for a kids party! happy "birthday"!! 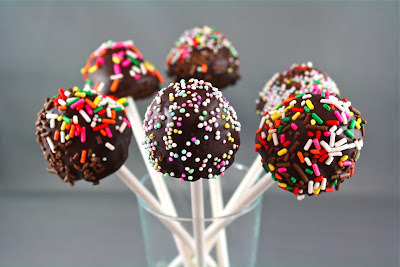 theese brownie pops looks divine! you should go after that other blogger for stealign your work! Those look really cute and you have me thinking about trying my hand at something like that for a New Year's party. As far as the other blog goes, some people just don't get how easy it is to get caught doing that sort of thing. Happy anniversary to you. That is great. As for the other blog I wouldn't stand for it. Would you allow them to steal from your restaurant if you had one? Congrats on your first bloganniversary! Keep up your wonderful work. I recently discovered your blog and love it. I wanted to let you know today is my one year blog anniversary too! How funny! like the blog hows it going? Happy Anniversary, I love your recipes and pictures! Those ppl are completely shameless. They have copied everything and substituted "England" for everytime you write "Vancouver" !! Shocking. Holy cow these look fabulous! I love your blog and have been following it for a while now. I have tried the hasselback potato recipe and it turned out great! Happy anniversary. Disgusting behaviour from the other blogger. you should be flatterd and upset too. Hope you have sent them a message informing them they have been caught. The brownie pops look fun. These brownie pops look great! As far as that other blogger...it's wrong. I'm sure you work very hard on your blog and why should they be allowed to steal your work? It's one thing to use your recipe and make a meal but it's quite another to steal your photos and all your stories. They should be warned and if they don't take your pictures and information off their site you should go about having their site shut down. I know it sounds harsh but just think about how hard you work and how slimy it is of them to steal your work and take the credit. Happy anniversary and may there be many more anniversary to Seasaltwithfood.com. How fun! Happy 1 year anniversary! Happy 1 year! Looks like a lollipop..^^ But a more decorated one! Happy anniversary. The brownie pops look yummy! @lk- healthy delicious: Thanks and yes I am going after him. @oneordinaryday: You should get the brownie mold and happy baking! 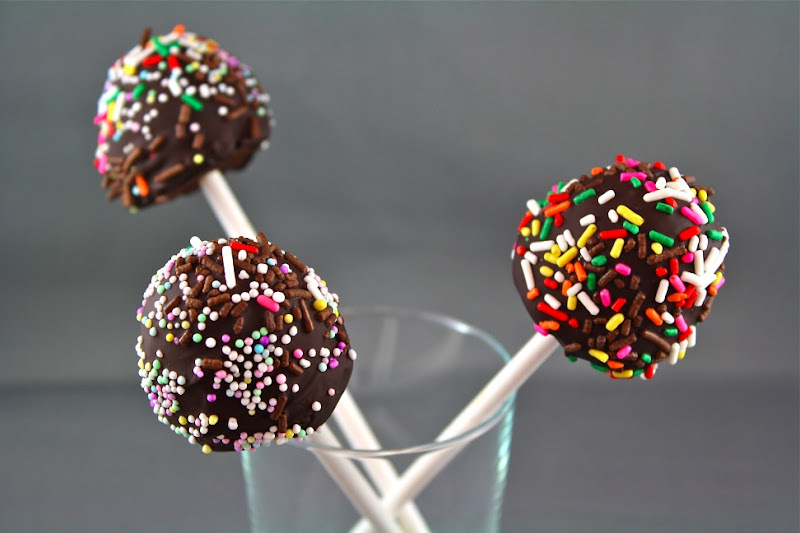 @Weekend Carnivore: Brownie pops for New Year's party sounds great to me. I guess some people do not know the meaning of "plagiarize". Hey Lori, thanks for the concern. I did get some responses about the issue. Looking good as for now. @Stephanie: Sorry for the late reply. Congrats to you too. Those Ice Pumpkin Cookies looks good! Hi faye, thanks for the compliments. Exactly! Vancouver became England! I should LOL!! @supersweetsilver: Thank you so much. I'm glad you like the hasselback potatoes. Do come back for more recipes. @Debs: Thanks and yes I should be flattered and upset too at the same time. @Nutmeg Nanny: Ya, I was contemplating at first but, I filed the complaints after reading some of the comments as advised from you guys. Btw, thanks for the advice. O my God....that stupid website plagiarized so many, many ,many and many of your posts! You really should have a label called 'Hall of Shame' and inculde those sorta plagiarizing stuffs in that category. Filing it under announcement sound too nice! And have you taken further action? Because many and many of your posts are still there, word for word including things like 'thought of making these for my kids....' from your Zhong Crescent Dumpling post. Re "Guy Boulud" using your recipes without your permission I think it is absolutely dreadful and you must report it. This only shows lack of work ethic and not at all flattering. Congratulations! I really seriously love your blog. The other blog is awful, I can't believe their cheek! I hope they read your entry and feel the shame!